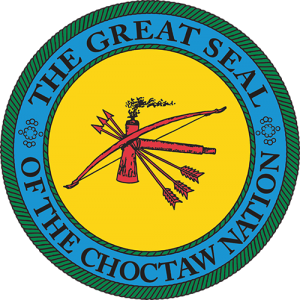 Choctaw Nation is a federally recognized tribe with its tribal jurisdiction comprising 12 tribal districts, 8 Oklahoma counties, with its headquarters located in Durant Oklahoma. As of 2011, Choctaw Nation has 223,279 enrolled tribal members of which 84,670 live in Oklahoma. The Choctaw Nation is governed by their own constitution that provides a three-branch government. Choctaw Nation traces its ancestry to Mississippi and some sections of Alabama. Legend has it that the Choctaw people originated from a sacred hill near Noxapter, Mississippi known as “Nanih Waya”. “Nanih Waiya” means “Productive Mound” and is often referred to as “The Mother Mound”. The Choctaws were the first of the five great southern tribes of the United States to be removed to Indian Territory (Oklahoma) in 1830. Over 20,000 Choctaws were forced on this long journey known as “The Trail of Tears”. Many of the Choctaw people did not survive this horrific march. Once there, the Choctaws quickly adjusted to their new homeland, which spanned three Oklahoma districts at this time. Here, through the efforts of early missionaries, the Choctaw adapted to a foreign religion and moral code, established a completely new educational system, adopted the constitution and legal system of an unrelated racial experience, and modified their agricultural and commercial practices to conform to a complex economic system. It did not take long for the Choctaws to establish their own school systems and an effective government. The Choctaws are a resilient people. Today the Choctaw Nation is a wealth of prosperity and success with a governing attitude of servitude. The Choctaw Nation has become deeply involved in economic development enterprises, which have provided many jobs for Choctaws as well as revenues to supplement the programs and services. The Choctaw Nation is the single largest employer in Durant, Oklahoma. They employ 2,000 employees in Bryan County, Oklahoma and roughly 8,000 people worldwide. The Choctaw Nation has helped build water systems and towers, roads and other infrastructures, and has contributed additional fire stations, EMS units, and law enforcement all of which have improved health, well-being, and economic growth. The Choctaw Nation operates several types of businesses including 7 casinos, 14 tribal smoke shops, and 13 truck stops. They are also the first tribe in the United States to build its own hospital with its own funding. At Andrew Jackson’s request, the United States Congress opened a fierce debate on an Indian Removal Bill. In the end, the bill passed, but the vote was very close. The Senate passed the measure 28 to 19, while in the House it narrowly passed, 102 to 97. Jackson signed the legislation into law June 30, 1830, and turned his focus onto the Choctaw in Mississippi Territory. On August 25, 1830, the Choctaws were supposed to meet with Jackson in Franklin, Tennessee, but Greenwood Leflore, a district Choctaw chief, informed Secretary of War John H. Eaton that the warriors were fiercely opposed to attending. Jackson was angered. Journalist Len Green writes “although angered by the Choctaw refusal to meet him in Tennessee, Jackson felt from LeFlore’s words that he might have a foot in the door and dispatched Secretary of War Eaton and John Coffee to meet with the Choctaws in their nation.” Jackson appointed Eaton and General John Coffee as commissioners to represent him to meet the Choctaws at the Dancing Rabbit Creek near present-day Noxubee County, Mississippi. On September 27, 1830, the Treaty of Dancing Rabbit Creek was signed. It represented one of the largest transfers of land that was signed between the US government and Native Americans without being instigated by warfare. By the treaty, the Choctaws signed away their remaining traditional homelands, opening them up for European-American settlement. The Choctaw were the first to walk the Trail of Tears. Article XIV allowed for nearly 1300 Choctaws to remain in the state of Mississippi and to become the first major non-European ethnic group to become US citizens. Article 22 sought to put a Choctaw representative in the U.S. House of Representatives. The Choctaw at this crucial time split into two distinct groups: the Choctaw Nation of Oklahoma and the Mississippi Band of Choctaw Indians. The nation retained its autonomy, but the tribe in Mississippi submitted to state and federal laws. Choctaw Nation’s tribal jurisdiction comprises 12 tribal districts and 8 Oklahoma counties. Its tribal headquarters located in Durant Oklahoma. The Chahta Anumpa Aiikhvna, School of Choctaw Language, was established to promote and preserve the language, history, and culture of the Choctaw people. The language program has grown from having one class taught at the University of Oklahoma via satellite in 1998, to currently having 31 employees and serving approximately 2,000 people per week through community classes, early childhood classes, public schools, colleges and through the use of the internet. There is one goal that the people of the School of Choctaw Language share: teach the Choctaw language to everyone that wants to learn. Today the Choctaw Nation is a wealth of prosperity and success with a governing attitude of servitude. The Choctaw Nation has become deeply involved in economic development enterprises, which have provided many jobs for Choctaws as well as revenues to supplement the programs and services. The Choctaw Nation’s annual tribal economic impact was over $822,280,105 in 2010. The Choctaw Nation is the single largest employer in Durant, Oklahoma. They employ 2,000 employees in Bryan County, Oklahoma and roughly 8,000 people worldwide. The nation’s payroll is about $180 million per year, with total revenues from tribal businesses and governmental entities topping $1 billion. The nation has contributed to raising Bryan County’s per capita income to about $24,000. The Choctaw Nation has helped build water systems and towers, roads and other infrastructures, and has contributed additional fire stations, EMS units, and law enforcement all of which have improved health, well-being, and economic growth. The Choctaw Nation operates several types of businesses including 7 casinos, 14 tribal smoke shops, and 13 truck stops. They are also the first tribe in the United States to build its own hospital with its own funding.